SAN FRANCISCO--(BUSINESS WIRE)--Millennial small business owners are committed to their businesses for the long term and are more willing to take calculated financial risks and incur debt in order to grow their businesses, according to a new Wells Fargo study of millennial small business owners. 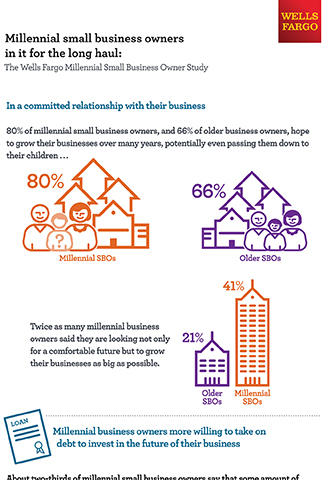 The study, conducted by research firm GfK, identified similarities and differences today between millennial small business owners and small business owners of earlier generations and how they are potentially impacting the business landscape. Millennial small business owners are more optimistic than their older counterparts about what the next year will bring. Three out of four millennial small business owners said they expect their businesses to improve over the next 12 months, compared to half of older small business owners. Millennial small business owners are also more apt than older small business owners to believe that they will increase customers, profitability, sales, and website traffic in the coming year. Although millennial small business owners are optimistic that their businesses will improve in the coming year, they still face challenges. Less than half of millennial small business owners feel very knowledgeable about (46 percent) or successful in managing (41 percent) their business’s finances. Millennial small business owners are, however, on a mission to seek out knowledge that will help their businesses grow. They are more apt to look for help outside their business than their older counterparts, citing friends and family, peers and competitors, social media and other online information sites as resources for their business’s financial success. The Wells Fargo Millennial Small Business Owner Study was conducted by research firm GfK from March 24 to April 13, 2016. In the poll, 1,005 U.S. Small Business Owners (SBOs) were surveyed. Approximately 500 interviews each were completed among Millennial (ages 19 to 35) and older (36 and above) small business owners. In order to qualify, respondents had to be in business for at least six months (but could be working on the business full- or part-time), be the business’s primary or shared financial decision maker, and own at least 50 percent of businesses that earn under $5 million in annual revenue. The poll is part of Wells Fargo’s efforts to understand and serve this important group of individuals helping to drive the U.S. economy. 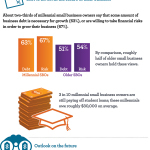 All results reported are from the Wells Fargo Millennial Small Business Owner Study. GfK is one of the world’s largest research companies, with more than 13,000 experts working to discover new insights into the way people live, think, and shop, in more than 100 markets, every day. GfK is constantly innovating and using the latest technologies and the smartest methodologies to give its clients the clearest understanding of the most important people in the world — their customers. GfK Public Affairs & Corporate Communications is a division of GfK. The group specializes in customized public affairs and public opinion polling, corporate communications and thought leadership research, and reputation measurement in the U.S. and globally. To find out more, visit www.gfk.com.